"You have a great attitude for someone who must be in so much pain," the massage therapist said after unsuccessfully trying to mobilize my shoulder. "That would be Jesus," I quickly replied, thankful that giving Jesus the credit for my attitude is becoming second nature. And it's true; there's not one good thing in me apart from Jesus. Without Him I'd just be a cranky, selfish mess. "It must be really bad for the therapist to say it's the worst she's ever seen." "I really AM having a lot of pain from this, not to mention the splitting headaches." "I am sick of having this pain all the time!" "Why does this always happen to me?" In just a few days time, I went from being "joyful in hope and patient in affliction" (Romans 12:12) to wallowing in self-pity. How did my attitude fall so far, so fast? Obviously, this is the work of the enemy. Isn't it just like satan to take a spiritual victory and try to turn it into defeat? This reminds me of the story in 1 Kings 18 when Elijah took a stand for God against the prophets of Baal and was given great victory. The next thing we know, Elijah is heading for the hills because Jezebel made a threat against him (1 Kings 19:3). Satan doesn't want us experiencing spiritual victory; he wants to knock us off the mountain top into the pit of despair. 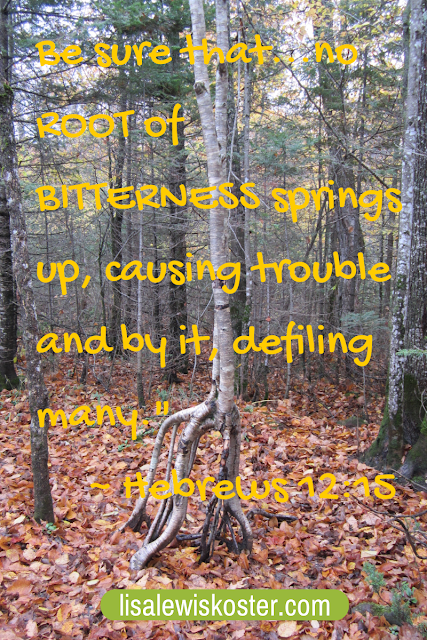 That's why he planted that little seed of discouragement precisely at the time when I was glorifying God. He wants me wallowing in self-pity because God is not glorified in that. Once I recognized what was happening, it was up to me to choose to uproot that seed before discouragement really took hold. Thankfully, I struggled only a few days before I realized what was happening and got back on track. My situation hasn't changed but my disposition has because my eyes are back on Jesus and off of myself. Father, it amazes me how much better my life is when I keep my focus on You and off my problems. I'm so thankful you allowed me to recognize I was headed in the wrong direction before I got too far off track. Thank you for continuing to use the hard things in life to make me a little more like you so that none of this suffering is for nothing. I love the scripture in your header -- great post too. wonderful post and great Scripture. And you are so right when you say Satan doesn't want us to have spiritual victories. I needed this today as I'm over tired, and have found my self complaining about the least little thing. THANK YOU!!! i needed this attitude adjustment. Thank you so much for sharing this encouragement with Thrive @ Home Thursday! Amen! "Keeping our eyes on Jesus, the Author and Finisher of our faith!" My life got a serious "punch in the gut" recently and keeping my eyes on Him (with occasional failures to do so, and starting again) has been the only thing that has seen me through. I'm so grateful that He can keep us stabilized during the roughest times. I love that even when Elijah was feeling sorry for himself, the Lord met him there in that moment & revealed Himself to Elijah. So grateful that He continually works & speaks into our lives to help us maintain our focus on Him. Thank you for sharing this post on A Little R & R as that is where I found you this morning :) Blessings!